Will Wonga pay a price for customer data breach? Over the last few years a number of high profile brands have seen their customers’ data compromised – as the result of a deliberate hack or because of inadequate security procedures. The latest brand to suffer is Wonga. Earlier this month the payday loan provider suffered a data breach and warned that up to a quarter of a million customers may have been affected by it. 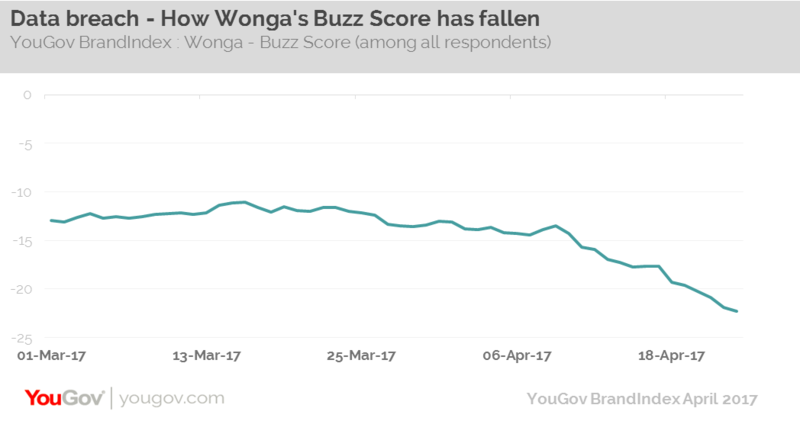 But how has the data breach affected Wonga’s public perception? Its Buzz score (whether someone has heard something positive or negative about the brand) was already in negative territory before news of the leak came out, although it had been improving in recent times. However, once details of the data breach came out the score fell from -13 to -24 – their lowest score since June 2015. Added to this, its Impression score (whether someone has a positive or negative impression of the brand) also decreased markedly, from -47 to -54. Our historic brand tracking data indicates that of all the types of crisis a brand can experience, data breaches can take the longest to recover from. A few months ago in this column I covered Tesco Bank’s data breach incident and YouGov’s Data Breach report indicates that while Tesco Bank has now regained the hit to its Buzz score, it took 14 weeks to do so. Clearly, the public has recognised the increased incidence of hacking stories and are worried about what they mean more generally. YouGov Profiles data shows that close to eight in ten (79%) consumers believe the state needs to do more to protect its citizens from hacking and cyber-crime. Companies should be aware that if they were to suffer a data leak, it could be more costly than if they were to be implicated in a tax or wage scandal. In those cases changes in policy can be promised and assurances made. However, when a customer finds their own details have been leaked, the crisis becomes much more personal and real, and with it comes an increased chance that consumer will lose trust in a brand.